Life is hard, noone ever promised it would be anything other than hard. 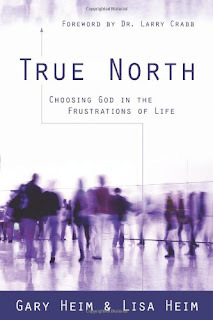 When trouble knocks us down do we look to the true north, to the One who created us? Often times we react like we aren't even in a relationship with Jesus when times get tough, acting much like the world does. The great battle is for our hearts and we can head north with them, or head south to false gods and what the world offers. Step by step Gary and Lisa Heim lead us through our frustrations, grumblings and groanings to a place where we can share grace, gratitude, and the greatest gift given to us and grow from there to giving and sharing the gift with others. Fantastic questions at the end of each chapter. Would make a good book study for a small/cell group or even as a couple wanting to reach toward God in times of troubles.